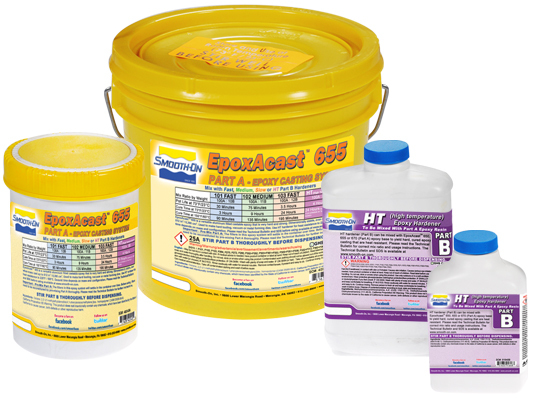 EpoxAcast™ 655 + HT Hardener Product Information | Smooth-On, Inc. Specific Volume 16.5 cu. in./lb. EpoxAcast™ 655 (formerly Metalset™ A-30) is a versatile aluminum filled castable epoxy that is very hard and strong. It is dimensionally stable, even when mass cast up to 512 in3 / 8,390 cm3. Maximum heat resistance is achieved using HT HIGH TEMP hardener (up to 225°F/108°C). 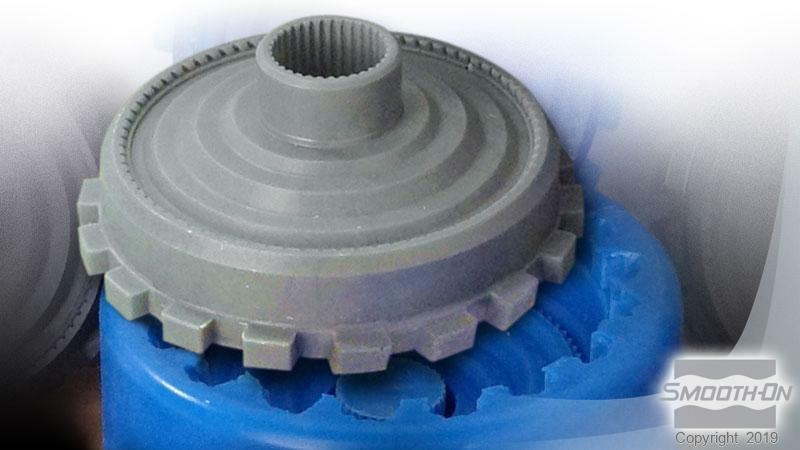 Cured EpoxAcast™ 655 epoxy has high physical properties and is used for a variety of applications including making hard tooling, vacuum forming dies/molds, injection molds, foundry patterns, jigs and fixtures and metal forming dies. Depending on project requirements, Part A Base can be mixed with 101 FAST, 102 MEDIUM, 103 SLOW or HT HIGH TEMP hardeners. 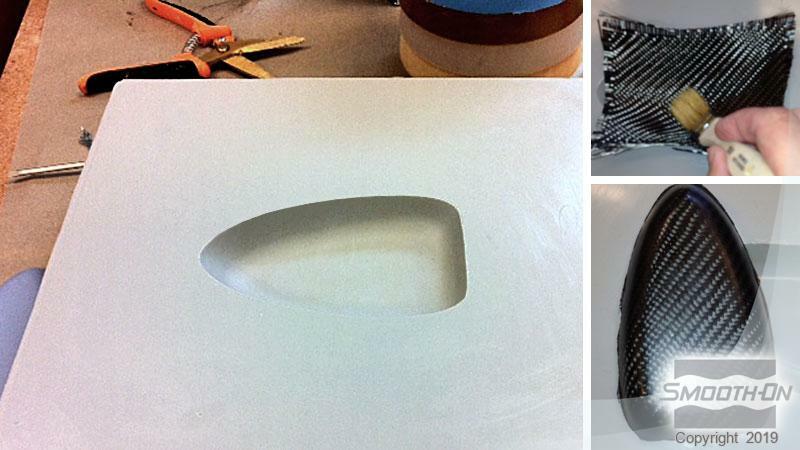 EpoxAcast™ 655 vacuum forming die cast from Mold Max® 30 silicone rubber mold. EpoxAcast™ 655 cast prototype from MoldStar® 30 silicone rubber mold. Guitar Keys cast from EpoxAcast™ 655. EpoxAcast™ 655 tool used for carbon fiber composite part. Materials should be stored and used in a room temperature environment (73°F/23°C). Elevated temperatures will reduce pot life. EpoxAcast™ 655 Resin and Hardener must be properly measured and thoroughly mixed to achieve full, high-strength, solid-cure properties. Mixing containers should have straight sides and a flat bottom. Mixing sticks should be flat and stiff with defined edges for scraping the sides and bottom of your mixing container. Pre-mixing Part A – The fillers in this epoxy system will settle in the container over time. Before using, fillers need to be reconstituted by pre-mixing Part A thoroughly. The best method is to use a “Turbine” mixer (available from Smooth-On) or similar drill mixer attached to a power drill and drill mix on medium speed for 2 minutes. Follow with hand mixing using a flat edge paddle for 1 minute until fillers are uniformly dispersed. Stir Part B thoroughly before dispensing. Measuring / Dispensing – Accurate measurement by weight is required for the material to cure properly and develop full physical properties. Dispense proper proportions of Parts A and B into clean plastic, metal or wax-free paper containers. You must use an accurate digital gram scale to weigh Parts A and B properly. Do not use an analog scale or attempt to measure components by volume. Adding Color - EpoxAcast™ 655 can be colored with UVO™ or IGNITE™ colorants. Pre-mix colorant with Part A thoroughly and then add Part B. Adding Fillers - A variety of dry fillers can also be added. Pre-mix dry filler with Part A before adding Part B.
Mixing – Be sure mixing utensils are clean and free of any potential contaminants such as dirt, dust or grease. Mix Parts A and B thoroughly for at least 3 minutes with a square edged mixing stick. Be aggressive and scrape sides and bottom of mixing container several times. Use the square edge of mixing stick to bring material off of the sides of container and blend. If using a drill mixer, follow with hand mixing as directed above to ensure thorough mixing. Vacuuming - EpoxAcast™ 655 is low in viscosity compared to other epoxy casting systems and does not require vacuum degassing. If you choose to vacuum the material, subject mixture to 29 h.i.g. mercury in a vacuum chamber until mixture rises, breaks and falls. Allow for 5 times volume expansion in mixing container. 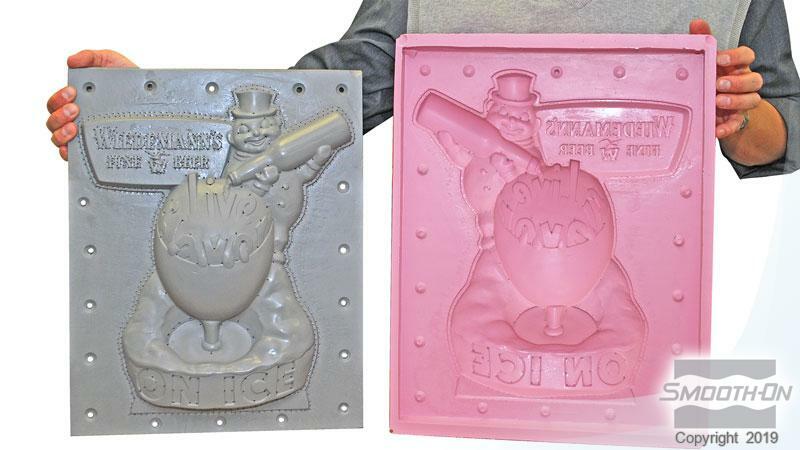 Pouring – If casting EpoxAcast™ 655 into a rubber mold, pour mixture in a single spot at the lowest point of the mold. Let the mixture seek its level. A uniform flow will help minimize entrapped air. If making vacuum forming molds, it is best to use piano wire (15/1000 inch gauge) to make vacuum holes. Cure Time - Refer to specified Cure Times in the Handling Properties section. 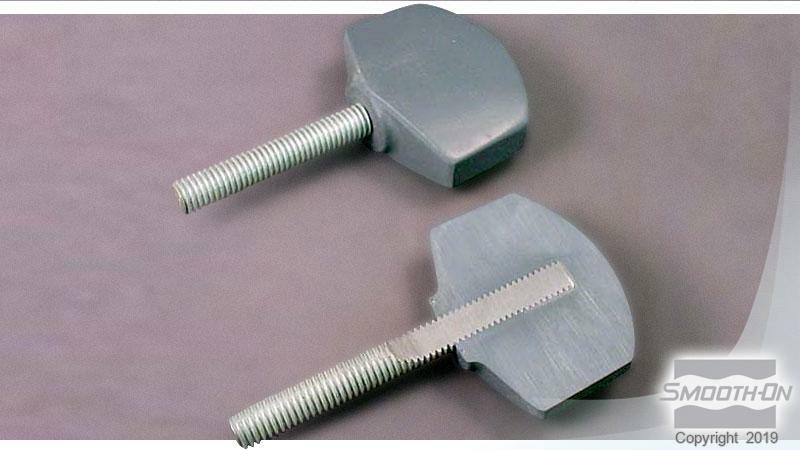 Cured material will be hard and unable to penetrate with a finger nail. Cured epoxy can now be dry sanded. If machining or sanding, wear NIOSH approved mask to prevent inhalation of particles. Pot Life and Cure Time values are dependent on mass and mold configuration, as epoxies are mass-sensitive. 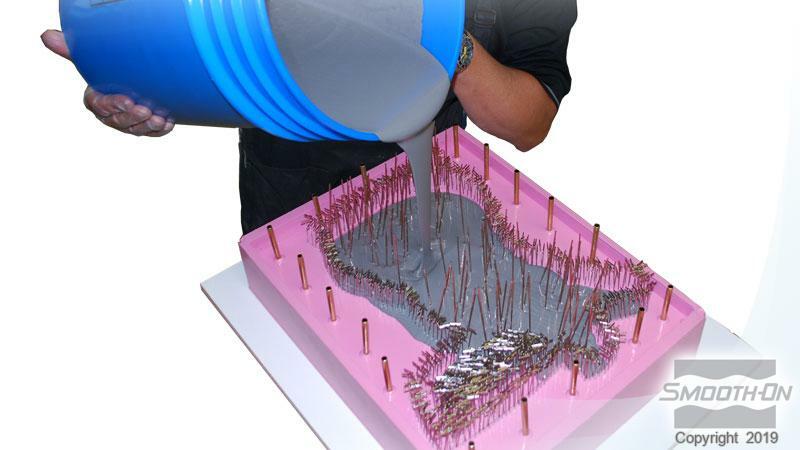 Heat Curing - For best results, EpoxAcast™ 655 should be heat cured in a dedicated industrial oven. Cure at 175° F / 80° C for two hours, followed by three hours at 300° F / 150° C. Allow material to cool to room temperature. Painting – Cured EpoxAcast™ 655 can be painted or primed and then painted with acrylic enamel paints. Let paint fully dry before putting part into service. Removing Epoxy – Uncured / Non-curing epoxy: Scrape as much material as possible from the surface using a scraper. Clean the residue with E-POX-EE KLEENER™ (available from Smooth-On), lacquer thinner, acetone or alcohol. Follow safety warnings pertaining to solvents and provide adequate ventilation.